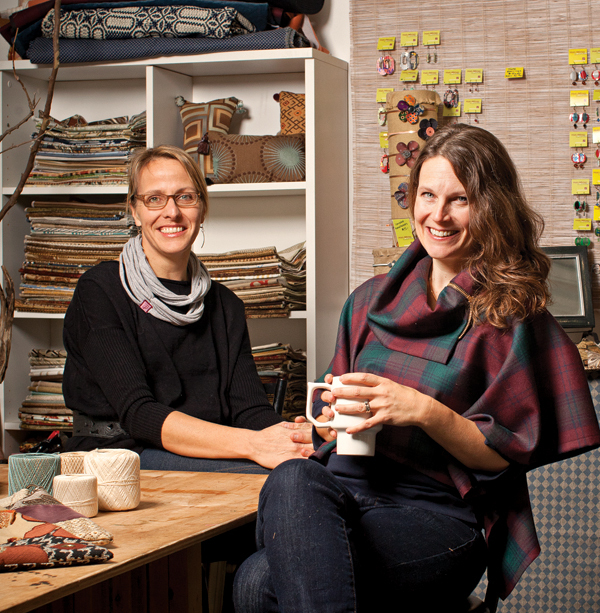 Despite having enough children between them to field a baseball team (nine kids from age 4 to 15, to be specific), Pam Fellerhoff and Nicole Reblando still found the time to launch a design business in 2011. They run HaloMiner out of Brazee Street Studios in Oakley, using clever patterns and repurposed materials to create unique clothing, accessories, and home decor items. Indeed, the company name comes from the way they mine discarded items for new potential. HaloMiner products can now be found in shops like Morrison & Me, Joseph-Beth Booksellers, Park + Vine, and very soon, Whole Foods. The creative partnership works because the pair tweaks each other’s ideas as they develop. The business works because they’ve divvied up tasks based on their skills. Fellerhoff (above, right) handles marketing and promotion; Reblando acts as account manager and has racked up their impressive retailer lineup. Both design and create products, and it was a mutual floral fascination that got them started. Fellerhoff started fusing together food-grade plastic bags to make “flowers” for hairbands and pins. Reblando stamped petals out of soda cans for earrings and necklaces. Friends offered up their husbands’ old oxford shirts, which have become aprons and girls’ smock dresses, and a windfall of donated upholstery fabric samples have found their way onto tote bags. Some of HaloMiner’s most elegant pieces—clutch purses and women’s zippered capes, for instance—are made from recycled men’s suiting.